teams to score in additional ways. Kasun Interception Clinches White Comeback: Walk-on Kyle Kasun’s interception on the final play brought the White team (defense) all the way back for a 46-41 victory in Nebraska’s Red-White Spring Game in front of 72,992 fans. In a uniquely scored game, the White rallied from a 16-point second-half deficit to win. The offense played well under quarterback Tommy Armstrong, who completed 8 of 15 passes for 80 yards and rushed six times for 120 yards, including a 37-yard touchdown run. Devine Ozigbo picks up yardage. I come out of this spring game ... thinking this 2016 team will be a little bit better than last year’s team. Would you rather have three running backs that are relatively equal in capability, or one that was outstanding? Armstrong reminded us all that he just might be the best ball-carrier the program has. If all goes well in his development, O’Brien will look back at the 2016 spring game and laugh at his interception – and his emotional response. What Saturday and this spring showed us is what we probably already knew: Armstrong is the guy this fall. 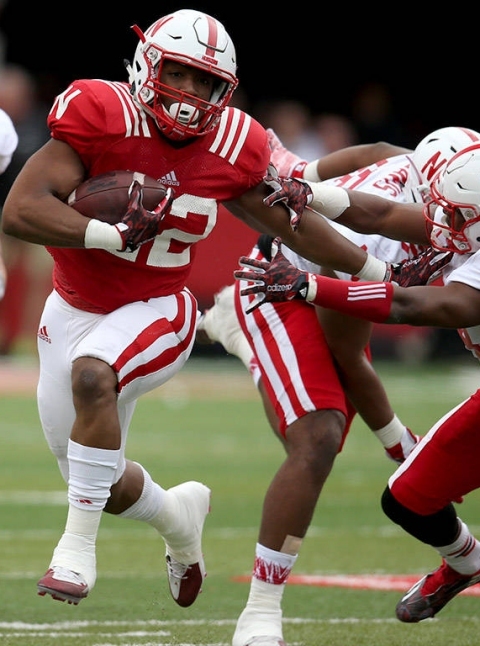 Bottom line, Nebraska just might have something going on offense.